I’m going to have to blame my lateness on my current situation: my over a week long illness that’s taking its precious time and does not seem to want me to get better yet. It made my Halloween preparations and plans very difficult, but I still managed somehow, even though I did have to give up a few things I wanted to get done. It was especially frustrating last week because I had started getting sick last Monday and miraculously the next morning I was all better, but the sneaky little bugger came back with a vengeance the next day and since then I have been battling it for almost 2 weeks now. Anyway, on to what I was able to accomplish during my sick week. I was able to sew part of my Halloween costume. I was little red riding hood and I decided to sew my own cape. It came out pretty well, I’m just thankful I didn’t mess it up (it was my first time sewing anything). I baked two items out of the three items I had planned for Halloween, and I also managed to give out Halloween candy. This year I decided to try out some new recipes. 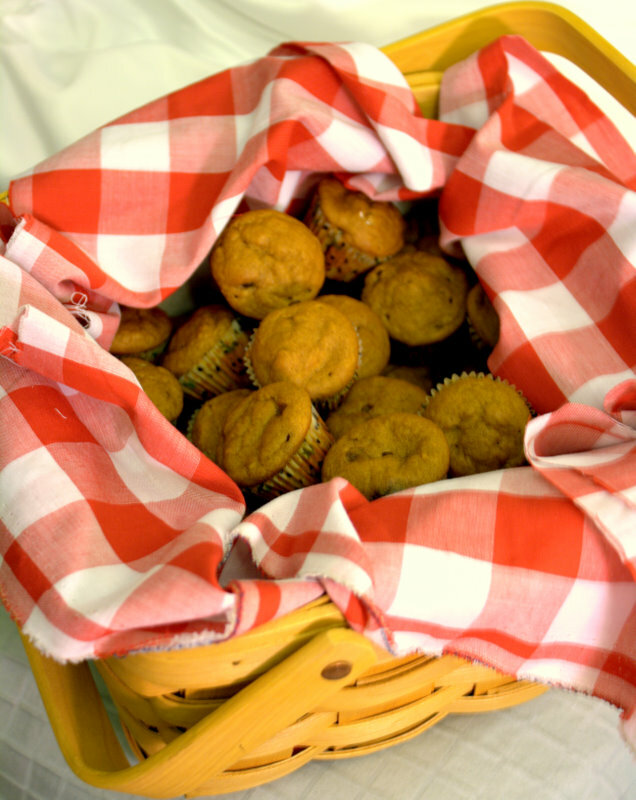 I baked Buttermilk Spice Muffins (the exact recipe from Mimi’s Cafe, I couldn’t believe they just posted it on their website) and Pumpkin Chocolate Chip Muffins. The Buttermilk Spice Muffins were good, although next time I might double the spices. Unfortunately, I personally can’t tell you how good the Pumpkin Chocolate Chip Muffins were. By the time I made these, I couldn’t really taste anything anymore, but my friends seemed to like them so there’s a good sign! I’ll have to try baking them again when I’m not sick. I’m happy to report that I think I’ve perfected my oatmeal chocolate chip recipe. This recipe is a modified version of one that I was using previously and it makes great chewy soft cookies with a little bit of added texture from the oatmeal. The key to this recipe is that I use toasted quick cook oats which you can find at Trader Joe’s. These oats are already toasted and really give a great texture in the cookies. When I was at the store buying my ingredients, I just happened to pick the toasted oats instead of the regular oats and it turned out to be a winner. My friends say that they like the texture in my cookies better than other ones and the only thing that I can attribute it to is that the oats are toasted. I guess the toasted oats prevent them from getting moist in the cookie so they stay nice and crisp. These cookies make great gifts too. I made a batch of cookies, placed them in a nice tin with some tissue paper, tied it with a ribbon and voilà! Perfect gift for any cookie lover/monster. In a large bowl, cream margarine/butter, brown sugar, and white sugar together until smooth. Beat in eggs one at a time, then add the vanilla. Mix in the flour, baking soda, and salt; until well blended. Mix in the toasted quick oats and chocolate chips. Drop small heaping spoonfuls onto baking sheet. Bake for 12 minutes or until golden brown in the preheated oven . Cool cookies on wire rack. Makes about 40-50 small two-bite cookies (which is how I like to make them), but feel free to make them as big as you want. As promised, here are the recipes for the Vanilla Bean and Bananas Foster Creme Brulee I made from my previous post. I adapted both versions of creme brulee from one of Barefoot Contessa’s recipes. They both essentially have the same creme brulee base, but I spiced things up a little and tried to get a little bit more creative. After all this was a dessert challenge I was competing in. Since this was my first time making creme brulee, I decided to buy a creme brulee torch set from Bed Bath & Beyond. For $19.99, you get a set of 4 ramekins and a creme brulee torch (warning: the torch does not come with butane, so you have to buy that separately at another store like your local grocery or hardware store). I really liked the set of ramekins the kit came with; they are not too deep and are the perfect size for individual servings. As far as the whole baking process, it was fairly easy and not time consuming at all. All I had to do was mix the ingredients and pop it in the oven. The only thing that took a little bit of time was cooling the creme brulee for a couple hours in the fridge. The best part was of course the torching. I made sure to put plenty of sugar(I like having a thick layer caramelized sugar on top) and torched away. Another thing to note is that if you do end up buying the creme brulee kit, the mini torch takes a bit longer to caramelize the sugar. So, don’t fret, the torch will do its job, but just don’t expect to have the creme brulee caramelized in 5 seconds so plan accordingly. 1) Preheat the oven to 300 degrees F.
pan which will mean its ready. 3) Very slowly stir in the cream into the egg mixture. 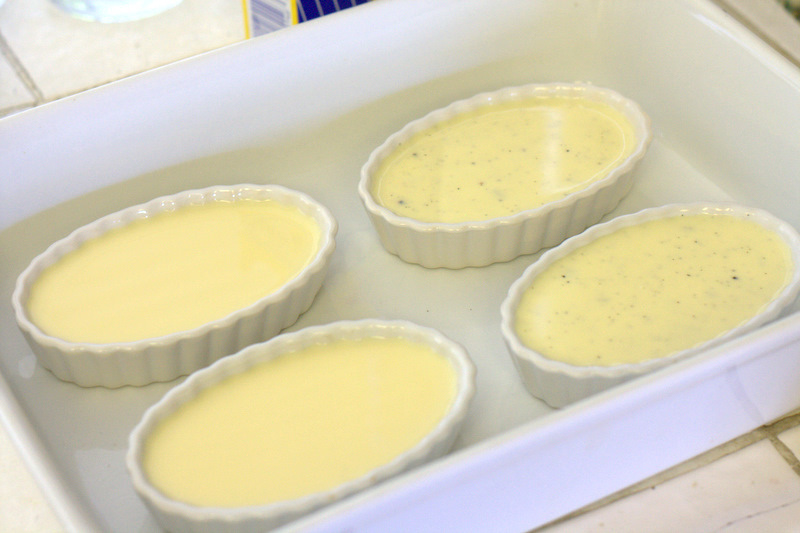 Add the vanilla beans and pour into ramekins until almost full. the water bath, cool to room temperature, and refrigerate until firm. the sugar carmelizes evenly. Allow to sit at room temperature for a minute until the caramelized sugar hardens. 3) Very slowly stir in the cream into the egg mixture. 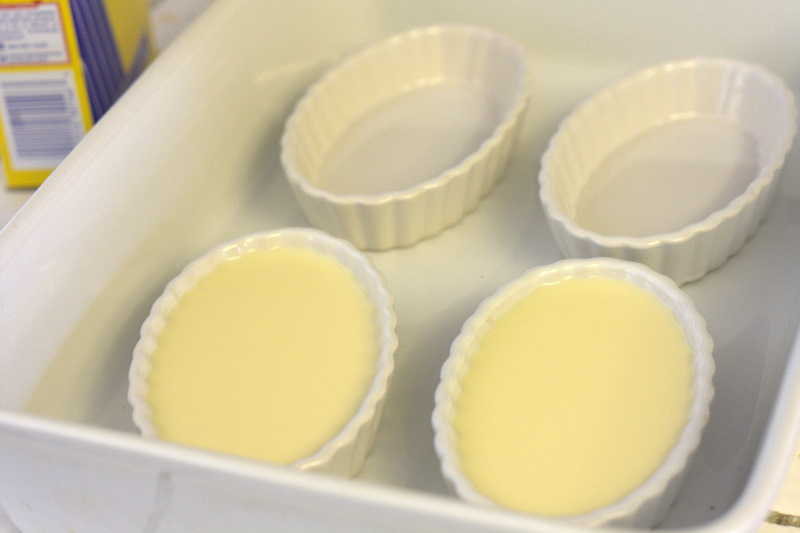 Add the vanilla extract and pour into ramekins until almost full. covers the creme brulee well. Sprinkle cinnamon on top of the bananas. 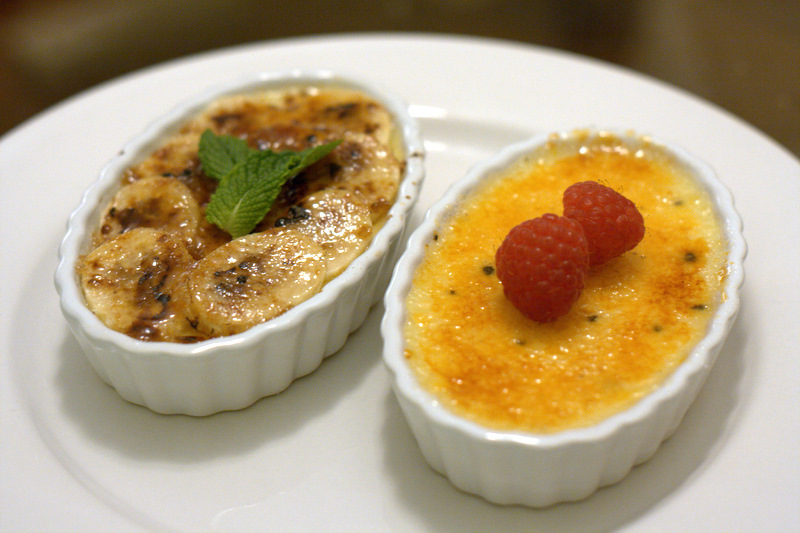 Note: The bananas fosters creme brulee will caramelize faster and may burn easily due to the brown sugar, so be careful! 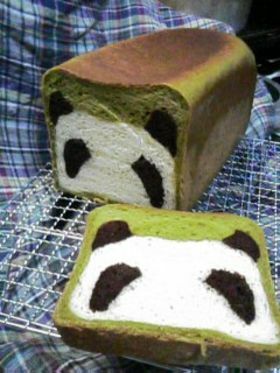 English version of the recipe can be found be found at Perfect Pandas. It took me more than just a few drops (17 to be exact) to get the prefect green I wanted. I never thought I’d be saying this, I made cheesecake. For those of you who don’t know, cheesecake is not my dessert of choice. I had a bad experience once and ever since then I can’t eat it…just brings back those bad memories. But, I found that I can get by with eating cheesecake that’s flavored and helps mask that strong cheesecake taste. Anyway, I decided to make a White Chocolate Raspberry Cheesecake and this was by far one of the most difficult items I’ve baked. There’s so many things that can go wrong with baking cheesecake…cracks, sinking, and it’s hard to tell when its done. Luckily, mine came out perfect. I really had to baby it the entire process. Although it was quite a bit of work and pretty nerve wracking, I really enjoyed making it and as Carla from Top Chef says, “It’s all about the love”. In a bowl, mix together crushed Oreos, 1 tablespoon sugar, and melted butter. Press mixture into the bottom of a 9 inch spring form pan. Preheat oven to 325 degrees F. In a microwavable bowl, melt white chocolate chips with half-and-half in the microwave, stirring occasionally until smooth. In another microwavable bowl, microwave 6 tablespoons of raspberry jam for 30 seconds. In a large bowl, mix together cream cheese and 1/2 cup sugar until smooth. Beat in eggs one at a time. Blend in vanilla and melted white chocolate. Pour half of batter over the crust. Spoon 3 tablespoons of raspberry jam over batter. Pour remaining cheesecake batter into pan, and spoon the rest of the raspberry jam (3 Tbsp.) over the top. Swirl batter with the tip of a knife to create a marbled effect. Wrap foil around the bottom of the spring form pan to help prevent leakage. Place spring form pan on a cookie sheet. Place cookie sheet with spring form pan in the oven and fill the cookie sheet with water (this technique will help prevent cracks). Bake for 60 minutes and then turn of oven and let the cheesecake sit in the oven for another hour (this will help prevent the cheesecake from sinking in the middle). Cover with plastic wrap, and refrigerate for at least 8 hours before removing from pan. To remove cheesecake from pan, run a knife around the edge of the cake to loosen it from the pan. Slowly remove the spring form pan. Decorate with fresh raspberries and enjoy! Cheesecake ready to be placed in the oven. I love the marbling effect! Decorated and ready to eat! So, how did it taste? It was great and I think everyone who loves cheesecake would really enjoy it. However, I thought it could use a little more raspberry jam (personally, I’d rather have a more raspberry and less cheesecake taste), so next time I’ll probably double the amount of jam, just cause I love raspberry. 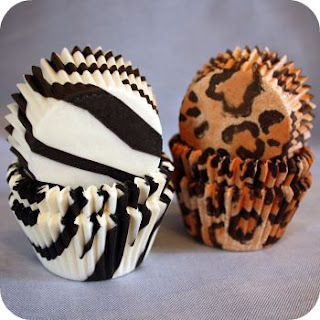 Animal Print Cups – For your wilder cupcake side. Bavarian Rose Cups – Very pretty! Solid Color Cups – These are awesome and so bright! I want each color! 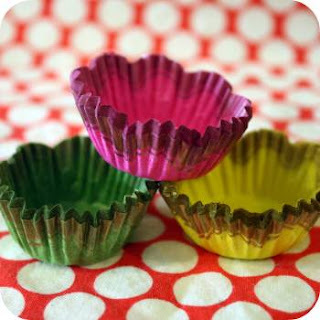 Fancy Foil Cups – I normally use foil cups and these are a new great alternative to plain ol’ silver. 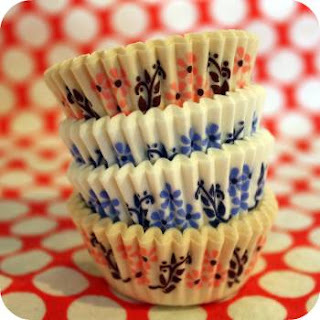 Fluted Flower Cups – These cups are so adorable! 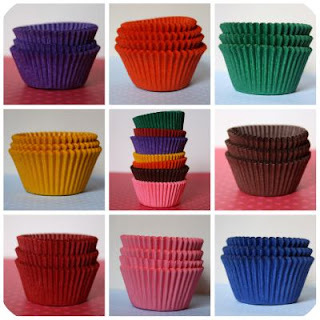 They’ll really make your cupcakes stand out. 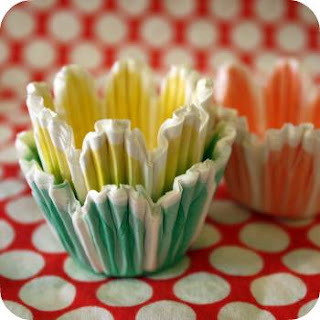 Mini Bali Candy Cups - Although it says candy cups, you can still use them for cupcakes. 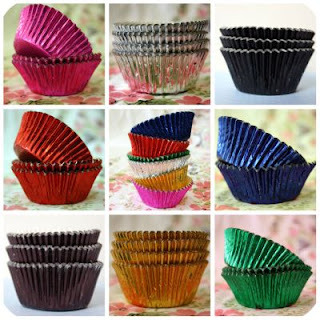 These will definitely make your cupcakes look like little jewels. In a large skillet, cook the sausage and onions over medium heat, stirring and breaking up the lumps until evenly browned. Add the celery, rosemary, and thyme; cook, stirring, for 2 minutes to blend flavors. Place boxed stuffing in a large bowl and pour sausage mixture over it. Mix in chopped apples, dried cranberries, and parsley. Drizzle with chicken stock and melted butter, and mix lightly. Place stuffing mixture in a baking dish, cover with foil, and bake at 350 degrees for 40 min. Then remove foil and bake for another 15 min. All the ingredients in one bowl, ready to be mixed. I hope all of you had a great Halloween! Mine was especially great because I got to dress up in 3 different costumes haha. Anyway, this year I decided to try making caramel apples for Halloween. I love caramel apples, but I don’t really love having to try and bite into a huge apple or slicing it and taking the risk of any chocolate, caramel, and nuts pieces breaking off. So to avoid the mess, I wanted to try something new and make miniature versions. After some research, I found that a lot of mini caramel apple recipes started with a large whole apple and scooping out apple pieces with a melon baller. Sounds simple enough, but the results just didn’t look as appetizing as a whole caramel apple. So, I decided to go on a search for the smallest apples I could find. Luckily, Whole Foods had a huge selection of small apples and I finally found what I was looking for. I ended up buying “crab apples” which are the smallest apples I’ve ever seen. Most of the crab apples were slightly larger than ping pong balls, and they tasted a little sweet and tart. The whole process of making the mini caramel apples took longer than expected. Mostly, due to the fact that I had about 20 apples, and each took a while to prep and dip. The hardest part was sticking the lollipop sticks in…my hands were so sore from having to shove those little sticks in and you had to be extra careful because they bend so easily. I suggest wearing oven mitts while doing this or something to protect your hands. But after all the hard work, the best part was the decorating. I went a little overboard and decided to try and come up with every caramel apple combination I could think of (caramel, chocolate, nuts, m&ms, sprinkles, etc.). Overall, the outcome was a success and I’m happy to say that my friends enjoyed these mini caramel apples more than those ginormous ones haha. 2. Place lollipop sticks into the center of apple where the stem used to be. 3. Place wax paper on baking sheet and spray with cooking spray. 4. Melt caramel and dip apples into the caramel. Place on baking sheet. Let apples cool. 5. Melt chocolate and dip the caramel apples into the chocolate. 6. After dipping into chocolate, immediately place any additional toppings on the apple. 7. Place finished apples on baking sheet and let them set in the refrigerator. 8. Take apples out of fridge 15 min. before serving. Prepped and ready for dipping! These caramel bits were very easy to use and tasted great. I’ve been getting some complaints that I need to blog more…so here you go. 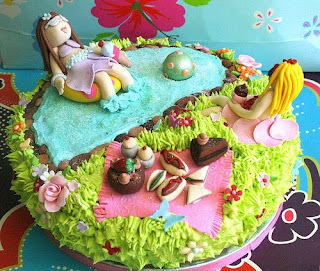 I found these pictures of amazingly over the top decorated cupcakes on Flickr. 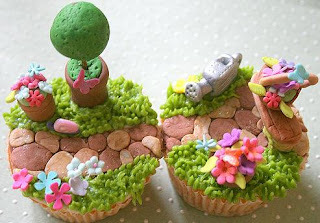 I never knew such cupcakes existed. In my world, cupcakes with frosting and a few sprinkles on top are good enough for me, but these guys go way beyond my imagination and unfortunately way beyond my skill level as well. 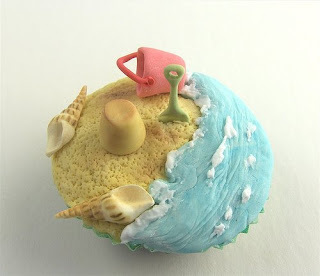 If I ever received or made a cupcake this nice, I really don’t think I’d be able to get myself to eat it. 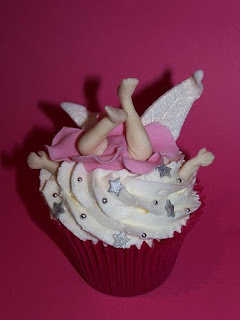 Crashed Fairy by Sandra (socake) – Haha I really like this one…its cute, funny, and something about fairies and cupcakes just really go well together. 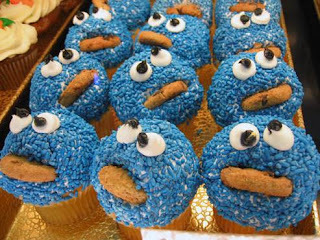 Cookie Monster Cupcakes by Princess of llyr – These are so cute! 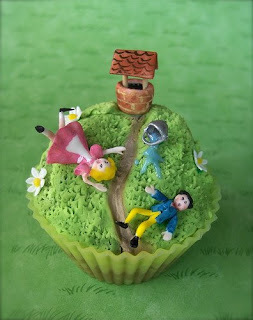 Jack & Jill Cupcake by abbietabbie - This cupcake is so creative! And that pail of water looks so real! 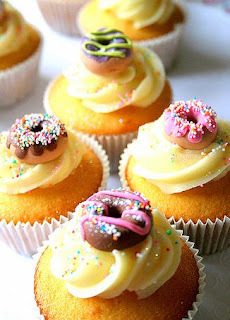 Donut cupcakes by Zalita - The mini donuts on top give it a great touch.